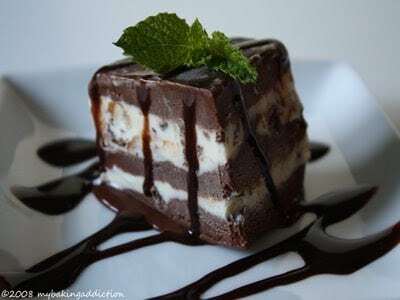 This week’s Tuesdays with Dorie recipe is a Chocolate-Banded Ice Cream Torte. The recipe was chosen by Amy of Food Family & Fun. Since it is basically ice cream and ganache, it involves quite a few steps and needs to be frozen in between layers. Therefore, make sure you have a bit of time on your hands before you tackle this one. I cut the recipe in 1/3 and used a 4 inch springform, which worked perfectly! The original recipe calls for raspberry ice cream; however, my bag of frozen raspberries disappeared on me, so I decided to simply do a vanilla chocolate chip torte. Note– I found the stupid raspberries two hours after my torte entered it’s final freeze…how annoying is that? Overall, the layering process was super easy, but as you can see from the above picture…layering things in a straight and even manner is not my forte. Here is the verdict…Did I love this recipe? Not really. Would I make it again? I doubt it. Don’t get me wrong, the taste was good, but this is just not a stand out in my opinion. If this post has ya wanting more, check out the TWD site; hell you may actually see some straight layers! This pic is just to give you a visual of the torte in it’s whole state…ignore the ice crystals! Looks great! Love the chocolate sauce. Yeah, I’m probably not going to make it again, but isn’t it great that we are making everything in the book so we can know what to try again! :) Great job! Yours looks really good. I haven’t made mine yet (running late). But, will soon. I, too, am going to go with the chocolate-and-vanilla option. Want something simpler than what’s in the book. Your photographs are beautiful. I’m in the same came with not planning to make it again. It wasn’t terribly *difficult* but there must be some secret trick not written in the recipes because getting straight layers was next to impossible for me. That looks so cute as a little 4 incher. That’s it… off to buy a mini springform pan! I love the chocolate drizzle! 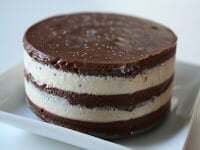 I think your torte in its whole form looks perfect! I actually think the crystals look great! I love the chocolate/vanilla option more than the raspberry, but it’s a shame that you found them after it was all set up! Looks amazing! The layer was spot on. Great job! That looks really good. Can I have some? wow you did a great job w/this challenge; too bad you won’t be making it again!